For most people, coming to college is extremely intimidating. Everywhere you turn, it seems like it’s new people, new places, new classes—new everything! This was especially true for me my freshman year. Move-in day was only the second time I had been to Transylvania, let alone, Lexington. Add to that the fear of being three and a half hours from home and the pressure of knowing only one other person on campus, this self-proclaimed introvert continuously found herself on the edge of discomfort. So, suffice to say, I know a thing or two about stepping outside of your comfort zone—and my advice? Embrace it! Don’t be afraid to introduce yourself first. Sometimes, Transy’s smaller size can be intimidating. Take the initiative to get to know your peers (especially during August term)! I know it can be nerve-wracking, but if you push yourself just a little and do something as small as saying hi to someone you met in the greet line, people will remember you. Be yourself! A lot of people get stuck on the mindset that they have to act a certain way to make new friends in college; however, that’s simply not the case. Don’t be afraid of what others might think of you. Embrace the qualities, likes, dislikes, and hobbies that make you who you are. Chances are, you’ll find someone who feels the same! Join organizations similar to (or completely different from) the ones you were a member of in high school! College campuses can be overwhelming with so many new faces; however, Transy’s intimate setting lends itself well to building relationships fast. By joining a club on campus, you’ll be able to hone in on smaller groups of people with similar interests as you that you can really get to know. You’re not alone! Homesickness is an inevitable part of transition to college for many students. Luckily, at Transy, you’re not alone. During August term, you’ll meet Resident Advisors, August Term Scholars, faculty/staff, and other students who are willing to lend a helping hand when homesickness starts to set in. Before long, you’ll be having so much fun playing sand volleyball, reading your favorite book under nice shade tree, or hanging out with your hallmates, that missing home will be a thing of the past. Whether it’s introducing yourself to a classmate, trying your hand a sand volleyball, or getting a group together to head downtown for a scoop of ice cream, always remember to lean into the discomfort. I promise, the benefits you’ll reap from these interactions far outweigh the millisecond of uncertainty or anxiety you might feel. It’s no secret, college is a huge transitory time in the lives of students. For some, the change is seemingly insurmountable. It can seem like the world is coming at you from all angles and you just can’t catch your breath. Between classes, co-curriculars, and getting settled into your new home, it can seem like you have no free time to just be. In this way, many students (from freshmen to seniors) find that they often neglect their mental health in favor of excelling in their studies; however, all too soon, many find that they soon neglect their studies too. While this sounds frightening, at Transylvania, there a myriad of systems in place to ensure the success of students both emotionally and academically, one of which is on-campus counseling services. Typically, students seek counseling for a variety of reasons including long-standing problems that interfere with their day-to-day activities, preventing the onset of additional problems, and even as an opportunity for open dialogue. At Transylvania, students have access to one-on-one counseling which provides them with the opportunity to talk with a counselor about anything and everything in a judgment-free environment. Transy’s counseling center services are kept 100% confidential and are never a part of a student’s academic record. Sessions with the center are up to the students’ discretion and may occur weekly, bimonthly, or as otherwise arranged. Other services provided by the counseling center include couples’ counseling and referrals to other mental health services in the area–all at no cost to you! Whether you’re a first-year or seasoned senior, counseling services can provide the help you need to tackle the personal, professional, and academic issues plaguing your mind. As with any other campus personnel, Transy’s counselors are just a phone call away and more than willing to help in any ways they can. So, next time you’re on campus, stop by our counseling center (located in the rear of the Campus Center) and say hello! 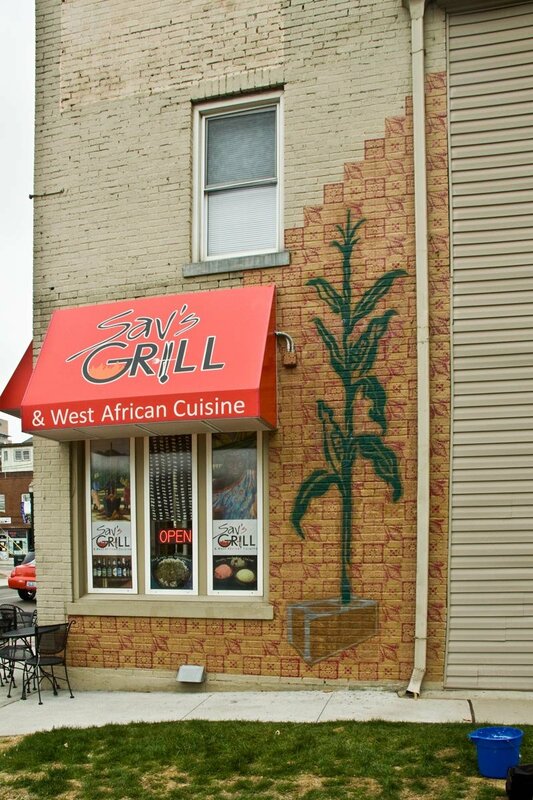 In spite of Transylvania’s longstanding place in the heart of Lexington, it is only within recent years that the greater Lexington area and members of Transylvania’s community have had a more interactive relationship. Recent years have seen the creation of paper lanterns hung in a local park, temporary murals displayed in local establishments, birdhouses distributed throughout out nearby neighborhoods, and marketing efforts with local non-profit organizations. As a Writing, Rhetoric, and Communication (WRC) student, I have had the privilege of being involved with two courses which have worked alongside community partners. My first efforts that took me outside of the Transy Bubble were a part of my Digital Rhetoric course. The course, taught by second year professor Dr. Kerri Hauman, unveiled the manner through which digital tools are influencing our understandings of rhetorical conventions and principles. Accordingly, we utilized a number of digital tools including audio recorders, camcorders, and online sites to create variosu pieces of work throughout the semester. In taking our studies a step further and outside of The Bubble, Dr. Hauman organized for our class of six (in conjunction with another WRC course)to work alongside of a local physical rehabilitation facility to create digital propaganda. My group was assigned to the facility’s Adaptive Recreation program. In doing so, we were given the opportunity to act as professionals in the work force. We were responsible for meeting with member’s on staff at the facility to determine what they were looking for in terms of final projects as well as organizing everything in between from interviews to filming. At the end of the term, our final was to present our projects to staff members at the facility. Another project I was involved with was a part of the Writing for/with Non-profits course offered during May Term. The course, co-taught by Drs Kerri Hauman and Scott Whiddon, allowed for students to partner with members of the Lexington Community Action Council to again, produce viable propaganda for the organizations we worked with. Throughout the process, students worked within small groups to determine what would best suit each Community partner and serve them well in the years to come. While both professors offered their full assistance when needed, they ensured that their presence maintained a distance so that students felt secure and confident in the final works produced. Students were offered a sense of autonomy which many had never before been afforded in an academic setting. Overall, both courses proved extremely rewarding. In terms of academics, I learned a great deal about rhetorical conventions and principles; however, in terms of practicality, I learned so much more. I learned how to work in a professional environment with members outside of the Transylvania community. Alongside my group mates, I worked to create finalized products which are ready to take their places in my digital portfolio. Most importantly, I learned to apply what I have been taught within each of my classes in a practical, real-world sense, and that alone, has been well worth the effort. No matter the class or professor, at Transylvania, students are continually encouraged to engage with the community around them using what they have learned in their classes. In this way, Transylvania students are leaps and bounds ahead of students on many other campuses who have been confined to the four walls of their classrooms. First things first, breathe. As I’m sure many of you have realized over the past few months, searching for a college to call home is not for the faint of heart however, all of those acceptance letters are certainly worth it. Even so, the work’s not over yet. Now, you get to turn the tables on the colleges you’ve applied to. You get to choose who gets your acceptance and who doesn’t—but you have a bit of time before you have to make a final decision. So, what happens if you choose to make Transylvania your home? Well, after you have decided that Transy will be your home away from home in a few short months, you will have a few important things to do which include: sending in your deposit to reserve your spot on campus, accepting your scholarship and financial aid package, and filling out other important documents found on the Admitted Student page—one of which is a roommate selection form. Ask about any student on campus, and one of their greatest fears coming into college was likely who they would room with. Luckily for Transy students, our Residence Life staff works tirelessly to match students accoding to the preferences they indicated in their roomate selection form. The form asks about students’ preferences for bed time, cleaning the room, desired room temperature, and even if you sleep with the TV on or off. Ideally, this helps makes sure that someone who goes to bed at 9:00 PM and wakes up at 7:00 AM, will not get paired with someone who goes to bed at 3:00 AM and wakes up at noon. Another great thing about Transy’s roommate pairing process is that you will find out who your roommate is before arriving on campus. This means you are able to coordinate on things such as who will bring the mini-fridge and who will bring the microwave. In the even that you have a specific person in mind to room with, there is an alternative to “random” roommate selection. If you aren’t comfortable with being paired with someone you don’t know, there is always the option of requesting a specific roommate; however, you both have to list each other on your roommate forms. If you don’t already know someone who you would like to room with or simply want to get to know more members of your class, check out the Class of 2019 Facebook group. Who knows, you just might meet your future roommate! It’s that time of year again! Spring has (finally) sprung, finals are near, and the end of the regular semester has come. In between rigorous study sessions and time spent enjoying the sunshine, whispers of May term can be heard throughout campus. But, what exactly is May term? Only the greatest thing ever (next to August term of course)! Transylvania’s academic calendar operates on a 4-4-1 schedule. This means that from September to December and January to mid-April, students are enrolled in four courses of their choosing. As for the 1, well, that’s the best part. May term is a four week period beginning at the end of April and running to the middle of May when students concentrate on one class Monday through Friday, generally for two hours a day. While this might sound pretty daunting, I assure you it’s quite the opposite. 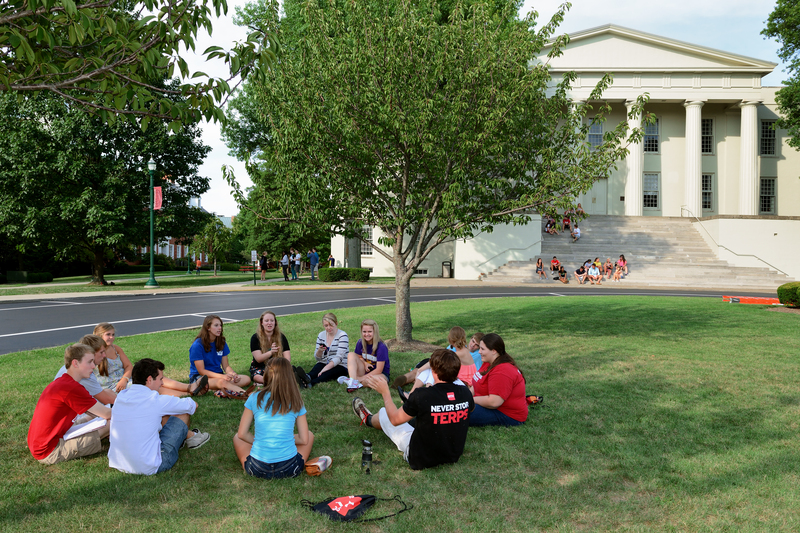 Many May Term classes take advantage of the great spring weather and hold classes outdoors on Transy’s gorgeous campus. A lot May term courses are team-taught by professors of differing disciplines which makes for a great opportunity to get to know professors outside of your area of study who you might otherwise never meet. However, one of the most notable things about May term classes is that many take place on campus for only a week or so at the beginning of the term, and then move to destinations in the U.S. and all over the world. Course offerings change from year to year, but recent travel courses have included trips across the Western United States, New York City, Peru, Ireland, and Cost Rica. For many students, semester-long study abroad may not be feasible. In this way, May term is a great way to get a “mini-study abroad” experience that is relatively affordable and just as enriching. Where will you travel during May Term? For students opting to enroll on a course taught at Transylvania, the options are just as vast (with many being Special Topics courses). This May term, I am taking a co-taught Writing, Rhetoric, and Communication course called Writing for Non-Profits. This is especially exciting because our class will be working with a community non-profit partner from the Lexington area to write grants. This is not only a course which counts towards my major but also will provide me with great practical experience which I can put on my resume. Another great things about being on campus during May term is the social time. During the regular semester, Transy students are pretty booked with classes, internships, sports, and other co-curriculars. During May term, with only one class to focus on, students tend to have a lot more leisure time to hang out with friends or get off campus; however, regardless of whether you’re on campus for May term or off, you’re guaranteed to have the time of your life! Social media users beware. In the coming weeks, your news feeds will no doubt be overflowing with #TBTs and #FBFs from #SB2K15 (for those who are less than tech-savy, that’s “throwback Thursdays” and “flashback Fridays” from “Spring Break 2015”). From statuses to photos, these posts will showcase the fun times had by many students during their brief interlude from classes and work. So, what exactly will you see? Traveling. Like countless others, many Transy students opt to travel during their break as they are heading South to soak up some sun, exploring the Big Apple, or getting to know local treasures. Similarly, I spent a large part of my break exploring neighboring cities back home in Western Kentucky; however, my favorite part of break featured a day trip with my dad to Union, Tennessee. Here, we visited the Discovery Park of America which, in addition to it’s regular exhibits, was currently hosting Titanic: the Artifact Exhibition. The park currently holds bragging rights to having the largest arrowhead collection under one roof as well as many other unique features including a theater simulation of a 19th-century earthquake, a 20,000-gallon aquarium, and a 60-foot replica of the human body! 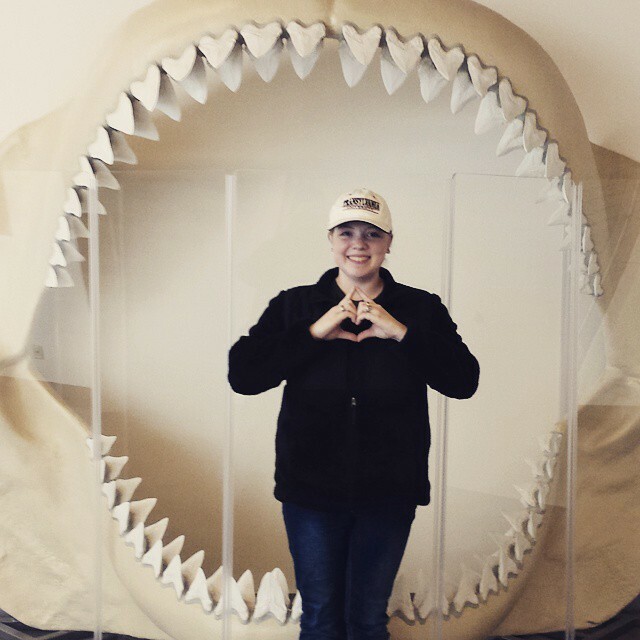 This scaled version of Megalodon’s teeth was just one of the cool exhibits housed at the park. Volunteering. Believe it or not, countless students to spend their break in service to others. 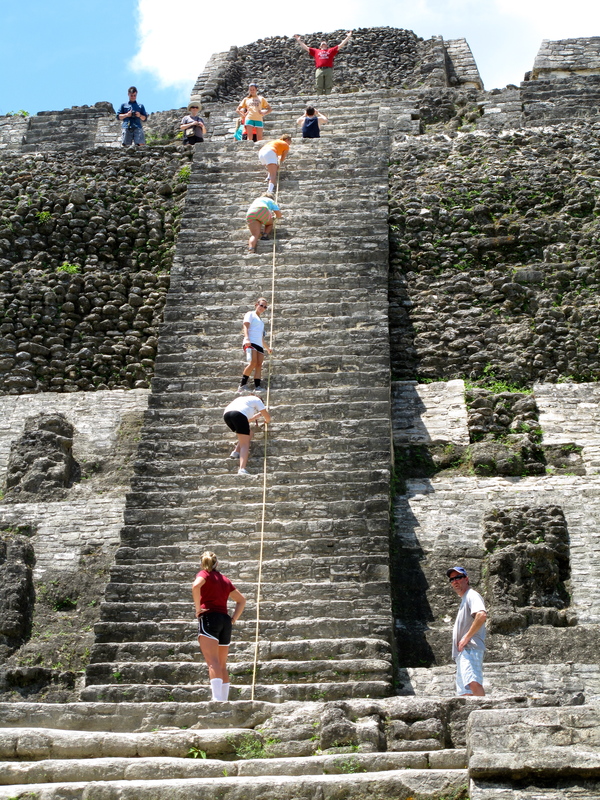 Transy makes this especially easy by facilitating alternative Spring Break (ASB) opportunities. Since its inception in 1993, ASB has provided students with the opportunity to participate in outreach and service programs outside of the greater-Lexington are. Past ASB projects have included providing disaster relief in the Midwest; building low-income housing in areas of Tennessee; and working with migrant farm workers in the state of Florida. Whether you chose to take it upon yourself to locate organizations/individuals in need or hop on board with ASB, service is certainly a productive way to spend your break! 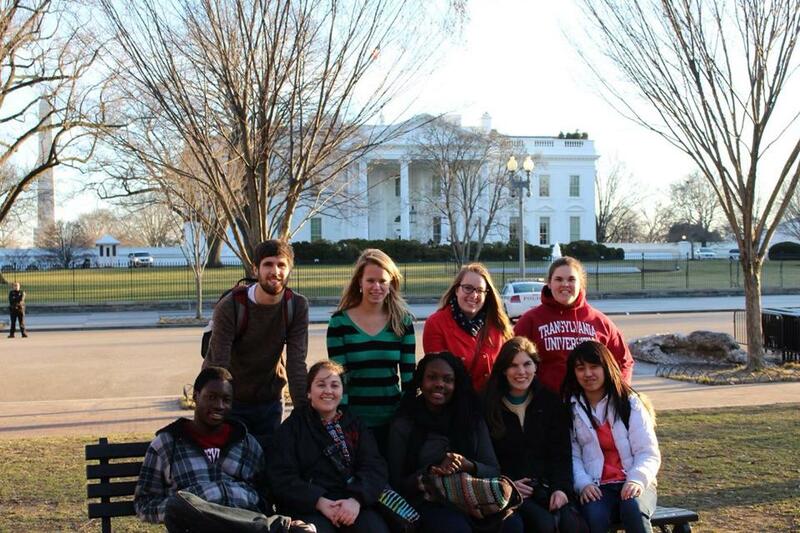 Here, a group of Transy students got to take a break from their service during ASB to explore our Nation’s capital. Relaxing. It’s no secret that Transy students are always on the move. While the aforementioned options are undoubtedly appealing, sometimes it’s nice to just relax. When Spring Break rolls around, don’t be afraid to pack your bags and head home for a week of relaxation filled with Netflix marathons, home-cooked meals, and plenty of cuddles from your favorite pet. Next year when Spring Break rolls around, where will we find you? Adapting to life in the dorms is a roller coaster of a ride for everyone. Whether you’re a seasoned summer camp veteran or someone who has never been away from home for more than a night, dorm life will inevitably throw you for a loop. So, what are the best and worst things about living in the dorms at Transy? Community. Transy’s size makes it incredibly easy to get to know your hall mates. For those who choose to take advantage of this, impromptu game and movie nights become weekly routines. Cost. While living in the dorms can seem pricey upfront, in the long run it’s often more cost-effective. Living in the dorms means no bills for utilities or unexpected repairs. Also, residents at Transy get access to free WiFi and cable TV. Convenience. Living in the dorms means that you don’t have to spend time searching through empty cabinets because you haven’t had time to go grocery shopping. At Transy, students can choose from four on-campus dining options throughout the week. For many, time in the “caf” (aka the cafeteria) is the highlight of their day as they unwind and catch up with their friends over a freshly prepared meal. Privacy. Dorm life means a significant decrease in privacy. When the fall semester rolls around, chances are you will be sharing your limited living quarters with a virtual stranger. But fear not, Transy offers excellent rooming accommodations—including a personalized roommate survey—which help make your transition smoother. Community Showers. While a vast majority of the horror stories we’ve all heard are mostly myth, community showers are not typically anyone’s favorite part of dorm life. Luckily for Transy students, majority of the residential halls offer suite style or private bathrooms. Thankfully, for those of us who happen to live in a hall with community showers, there are plenty of wonderful staff members who ensure the facilities are maintained and clean. Noise. Community living means that there may be more noise than you’re used to at home. From hair dryers and TVs to the neighbors two doors down listening to the latest screamo version of TSwift’s “Shake it Off,” there are a lot of distractions in the dorms. Because Transy understands the need for quiet, courtesy hours are set during which time residents must keep noise at a minimum. Through the good and the bad, dorm life is truly a one-of-a-kind experience that I think everyone should take advantage of. Want to know more about residence life at Transy? Seniors even have the option of scheduling an overnight visit, which I highly recommend that you take advantage of. We have admissions ambassadors who are also overnight hosts and have an extra bed in their dorm room just for you! Schedule your visit today to get an up-close look at a dorm room on campus and see first-hand how great life at Transy is!